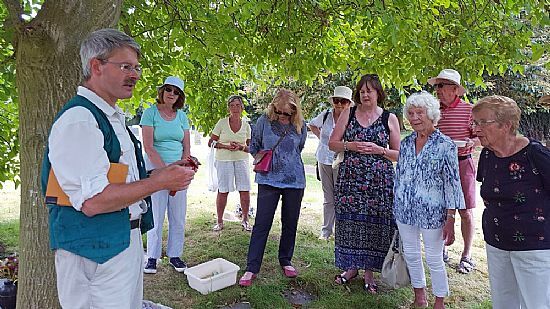 On Saturday 7th July 2018 we had a great fellowship event exploring St Mary's Churchyard; we met our Belvoir Angels and found out about the mysterious Reuben George Brooke. And it was all followed by a traditional afternoon tea in church, hosted by Plumtree WI. Paul divided us into three groups and showed us how to clean some of the headstones to make the inscriptions easier to read. 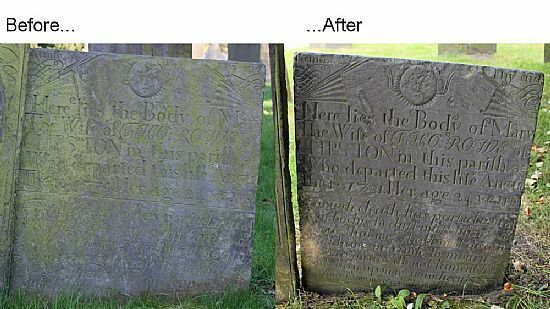 The Belvoir Angel headstone dedicated to Mary Rowe was stained with lichen, we gently removed the stain with soapy water and a sponge. Reuben George Brooke's headstone was also stained; we had to use a much gentler cleaning process - soapy water on cotton buds and a water sprayer to avoid damaging the inset letters. 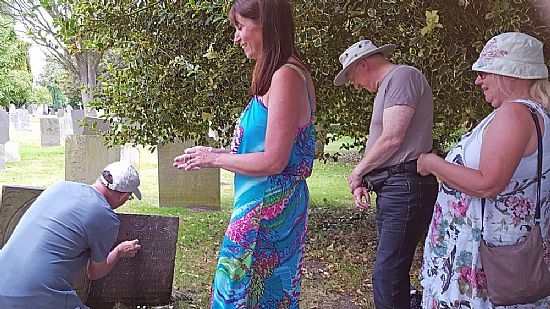 Finally, the third group tackled the headstone dedicated to Paul's maternal grandparents (Lily and William Seaton), a more modern stone attacked with a scrubbing brush, soapy water, cider vinegar and much vigour. 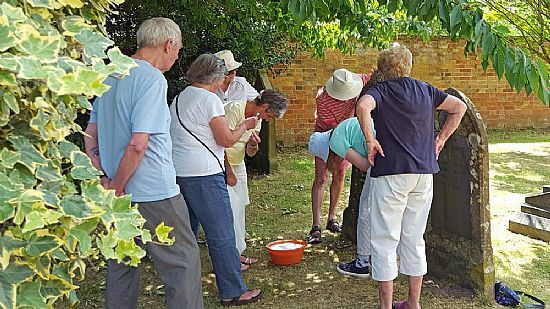 After our hard work, we retired to stand under the walnut tree where we ate fresh fruit and Paul explained a little about the history behind the Belvoir Angels, Reuben George and his grandparents. He showed us a tie made from the Seaton tartan. Then, quiz time: Can you find the Portuguese Laurel in the churchyard? What is its link with chillies? Can you find the remains of a medieval wall in the churchyard? 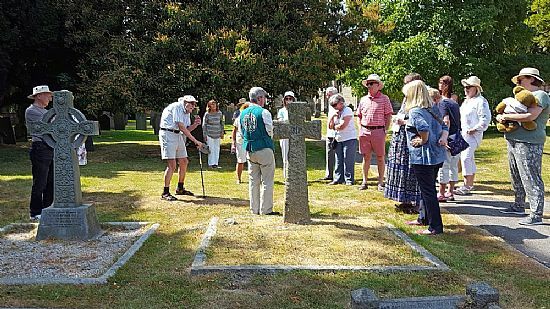 What in the churchyard links to the legend of the Holy Grail? 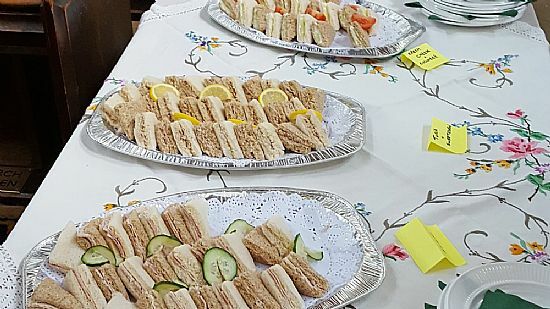 After being amazed by a fly-past from a buzzard, we retired to the church where we were treated to afternoon tea, prepared by the ladies of Plumtree WI. A wonderful end to a fun and fact-filled afternoon. Big Ted checks that this Belvoir Angel is looking its best before the Fellowship Event. A before and after shot of the Belvoir Angel. Good job! Paul shows us his bow tie made from the Seaton tartan. Big Ted has fallen asleep after an exciting, hot afternoon in the churchyard. Sandwiches, scones and cake provided by the ladies of Plumtree WI - yummy! 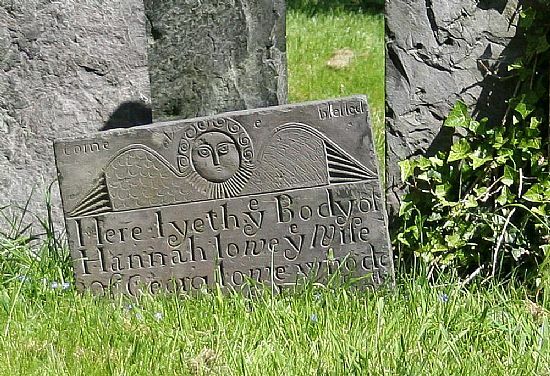 Amongst the headstones in many Nottinghamshire, Leicestershire, Rutland and Lincolnshire graveyards are those which depict a form of stylised ‘angel’, characterised by a round face, curls, down-turned wings, and a ruff around the neck. 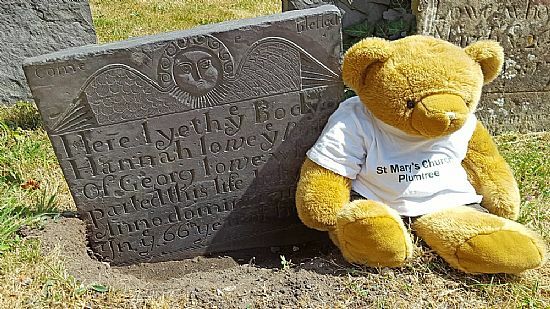 These angels are found on headstones in an area roughly defined by Nottingham in the west to Grantham in the east, and Flawborough in the north to Twyford in the south. It is their presence in this locality has led to them being termed ‘Belvoir Angels’. They are generally found on graves dating from 1690 to 1758 and are all engraved on stones usually made of Swithland slate, which is hard-wearing and weathers very well. This is the reason that so many Belvoir Angel headstones are in relatively good condition for their age. The Belvoir Angel headstone pictured left is to be found in Plumtree churchyard, on the grave of Hannah Lowe, who died on 20th July 1711 aged 65. The text ‘Come ye Blessed’ along the top is typical of a Belvoir Angel; other distinctive features are an hour-glass, hearts and even skeletons. There is another Belvoir Angel in Plumtree churchyard, on the grave of Mary Rowe who died on 12th August 1721 aged 24. You can find more information in the book: ‘Vale of Belvoir Angels’ by Pauline F. and Bernard V. Heathcote. In Plumtree churchyard, the headstone associated with Plot 83 holds a great mystery. It is dedicated to the memory of Reuben George Brooke “only son of Sir James Brooke KCB, Rajah of Sarawak”. It is thought that Reuben’s mother was either a maid at Sir James’s father’s house in Bath, or possibly she was Sir James’s one-time fiancée (the daughter of a Bath clergyman). Reuben was brought up as Reuben G. Walker in the Brighton household of Frances Walker. He appears in the 1841 and 1851 Brighton censuses, and was apparently born in Brighton around 1836. In 1858 Sir James Brooke publicly acknowledged his illegitimate son and Reuben took the surname Brooke. Reuben married Martha Elizabeth Mowbray (known as Elizabeth) at Windermere, Westmorland, on 10th July 1862. Elizabeth was from Nottingham. Reuben and Elizabeth had six sons and a daughter (James, Reuben George, Ruby James, Stewart, Walter Nicklett, Charles William and Ellen). 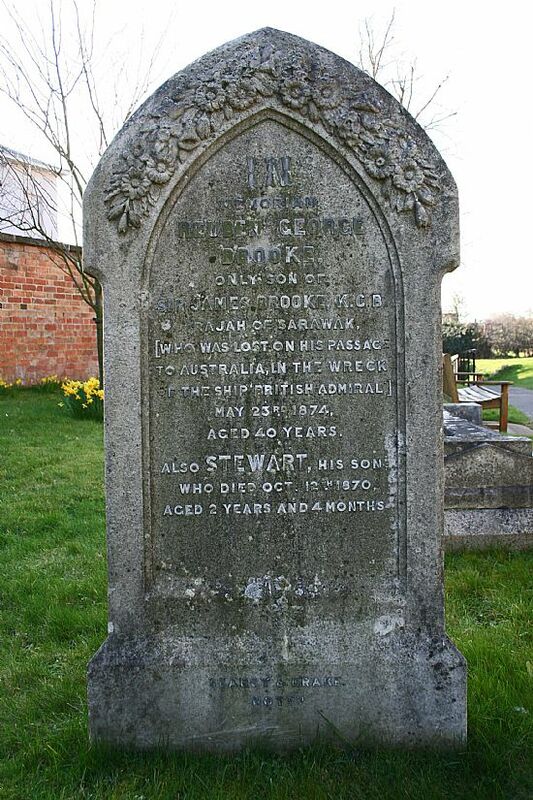 Stewart was baptised at Plumtree on 12th July 1868 but died on October 12th 1870 aged 2 years and 4 months. He is buried in Plumtree churchyard and is commemorated on the same headstone as his father. Reuben appears in the 1871 Plumtree census (without his family) as: “George Brooke”, age “40” (now he was born in 1831!) and his birthplace was given as “Sarawak, Borneo”. His occupation was listed as “Annuitant” – perhaps he was being provided for by his father. And finally, Reuben George died on 23rd May 1874, travelling steerage to Australia, on the ship “British Admiral” which was wrecked on rocks near King Island off the coast of Tasmania, killing 79 people. Why was Reuben George emigrating? What of his family? Was he really the son of the first white Rajah of Sarawak?